Easy inline integration. On-the-fly printhead servicing. Lowest cost per print. High print speeds. Professional resolution. Optional Watershield™ technology for enhanced water-resistance. 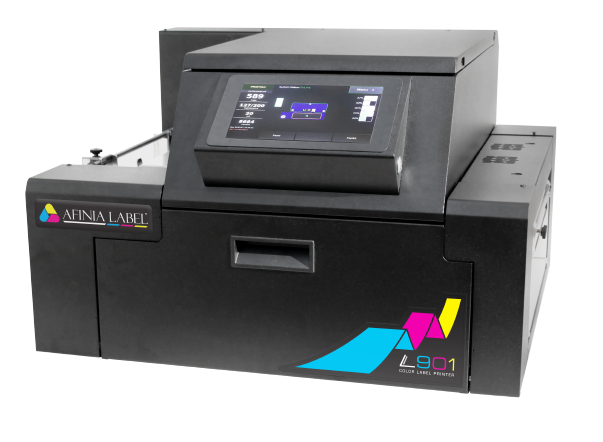 The L901 enables companies to run a full-colour digital label printer. Moreover in line with a finishing or application system & without complications related to mid-job printhead maintenance. Secondly this industrial digital label printer can produce full-colour prints with stunning image quality at speeds of up to 18m per minute. Therefore photo-quality images and exceptionally crisp text and barcodes are printed at up to 1600×1600 DPI via Memjet’s Sirius print engine. The XL Unwinder/Rewinder system pairs perfectly with the L901 to allow for continuous, roll-to-roll label production. Easily handle rolls up to 10″ in diameter outside diameter for high-volume jobs and reduced media costs.